Costa Lourandakis at Ocean Independence in Athens sends me all the details of his latest central agency, the traditional 46.4m motor sailor Arktos. Arktos was built by the Basimakopouli yard in wood to RINA class in 2004 and has been carefully maintained since launch. The construction of this superyacht was inspired by the 19th century sailing vessels of Galaxidi and the owner was keen to build a traditional ‘karavoskaro’ design reminiscent of older times combined with the amenities and safety requirements of a modern yacht. 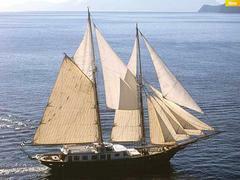 The sailplan and rigging of Arktos also follow tradition: she's a gaff rigged, topsail schooner with a long bow-sprit to accommodate several foresails. Sleeping 11 guests in a master, two double and two twin cabins along with a Pullman berth, Arktos is asking €3 million.